Pick up some milk. Gas up the car. Don't forget the library books! Meeting at 8 o'clock. Water the flowers. Don't you have lists like this around your house? I recently found the neatest little chalkboard for my front entryway. ( I highly recommend the 1 minute installation process!) So much traffic goes in and out of our front door that it seemed practical to have a decorative place for lists, reminders, and important info for the kids. Grocery lists and reminders can wait. 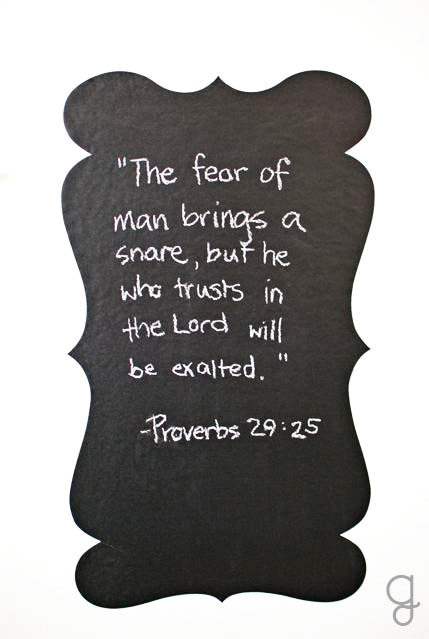 Today, we need the exhortation to trust in the Lord and leave the fear of man far behind. Can't leave home without it.